In the great tradition of the American almanac, The Areas of My Expertise is a brilliant and hilarious compendium of handy reference tables, fascinating trivia, and sage wisdom on all topics large and small. Although bestsellers such as Poor Richard’s Almanack and The Book of Lists were certainly valuable, they also were largely true. 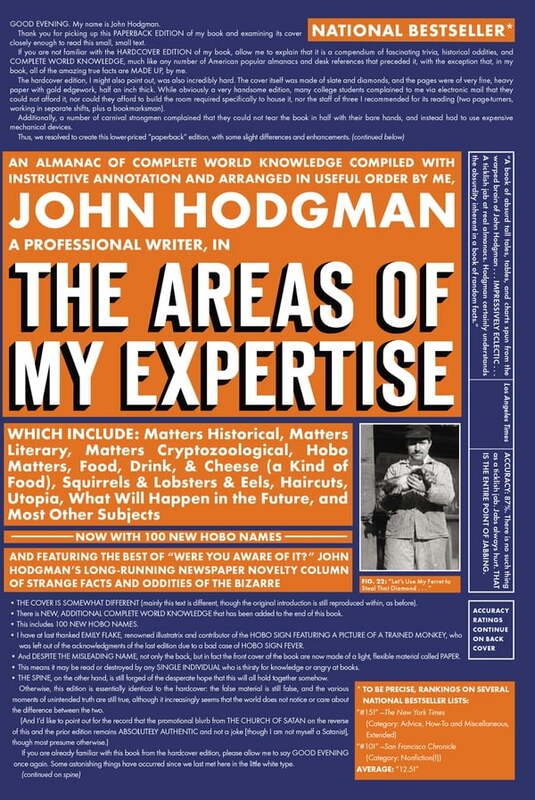 Here is a different kind of handy desk reference, one in which all of the historical oddities and amazing true facts are sifted through the singular, illuminating imagination of John Hodgman—which is the nice way of saying: He made it all up. -What are the mottoes of the 51 United States? -Who were the U.S. presidents who had hooks for hands? -What role does the Yale secret society “Skull and Bones” play in the secret world government? -What was the menu at the first Thanksgiving, and did it include eels? Technically, that is two questions, but do not apologize, for John Hodgman shall answer them both . . . LATER. -Aside from a compendium of fake trivia, what is the best kind of book to write? A SIMPLE TABLE OF THE 55 MOST DRAMATIC LITERARY SITUATIONS PROVIDES THE ANSWER, and John Hodgman is the author of that table. Imagine if The Book of Lists had been rewritten by Peter Cook and Jorge Luis Borges under the pseudonym of “John Hodgman” and then renamed The Areas of My Expertise, and you will only begin to have a sense of the dizzying, uproarious, sublimely weird, and strangely wise journey that is contained within this book (along with all the pages and words). Perfect for anyone who thirsts for knowledge, and especially for collectors of books of fake trivia, The Areas of My Expertise offers through absurdity a better understanding of the world we share—and recognizes that while the truth may be stranger than fiction, it is never as strange as lies . . . or as true.